Last week, our friend Mary Stec held the first of a series of cooking classes at her home. Dorianne went over to do dishes as the evening progressed. I, of course, offered to be wine steward, assuming that we would be pouring Richard (Mary’s husband and our wine co-op winemaker) Clark’s wine. Dorianne and I arrived a bit before the students and I examined the bottles of wine co-op red wine that Richard had set out. There were red blends, a Merlot, a Cabernet Sauvignon, and a Syrah. Once everyone arrived, I poured them each a glass and Richard and I headed down to the den to await further instructions, expecting that as each course (Tuscan Autumn Cooking) was completed, we would receive a sampling. Did I mention that Richard and I were drinking, well, let’s say different wine from the folks upstairs. I brought a 2007 Au Bon Climat White Table Wine, which was not chilled and had been stored in the refrigerator. Richard told me to select a wine from several cases that he had recently obtained – cases of VERY nice wines. 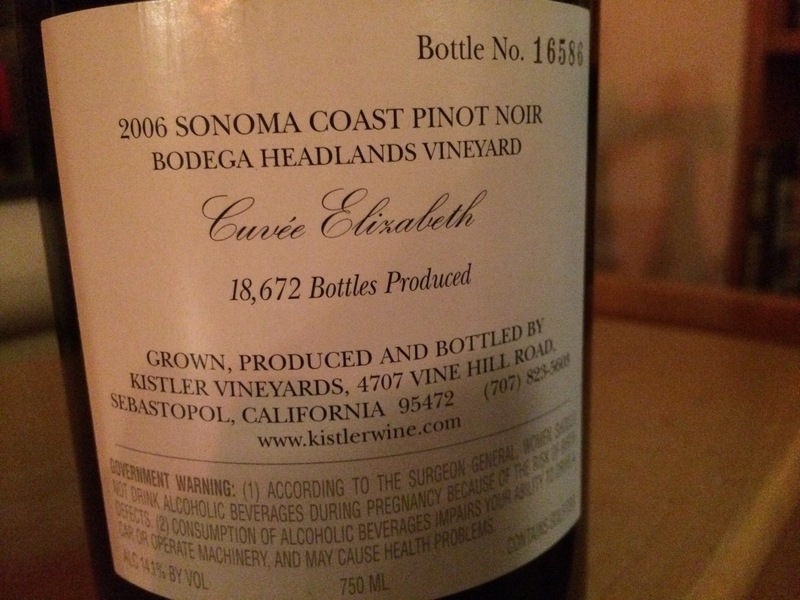 I pulled a 2009 Kistler Cuvee Elizabeth Sonoma Coast Pinot Noir, Bottle #16586; you know, something nice, but not at the top level of what was in those cases, so as not to appear greedy. 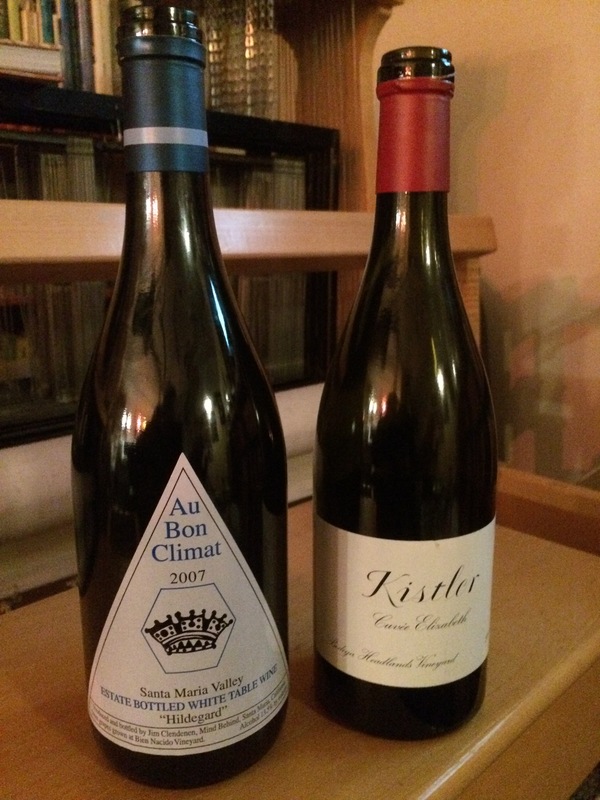 The Au Bon Climat & the Kistler. So we opened the Kistler – heaven! We sat back to watch a football game. The wine went down smoothly, but, after a glass or two, I began to wonder when the morsels of food from the cooking class would arrive. I asked Richard about it, but he was clearly on orders not to disturb the goings-on in the kitchen for ANY reason. So we finished the Kistler. After a few minutes of sitting with empty glasses, I boldly went up to the kitchen, circled through the living room so as not to walk through the class, and entered the back near the refrigerator. Nothing resembling completed food was in evidence. Coolly, I slipped the Au Bon Climat from the refrigerator and retraced my circuitous steps to the lower den. We opened the bottle and basked in the explosion of perfectly aged wine with strong fruit, great structure, and nearly perfect balance. Food, what food? Oh, food – getting hungry – it’s almost 8:30. Not even an appetizer in site. A friend, Keith, taking the class, passes through the den on the way to the rest room. “Food?” we ask. “You want some food? Sure.” So after completing his mission, Keith goes upstairs and gets us some crackers and a kind of cheese dip. We are in good shape. 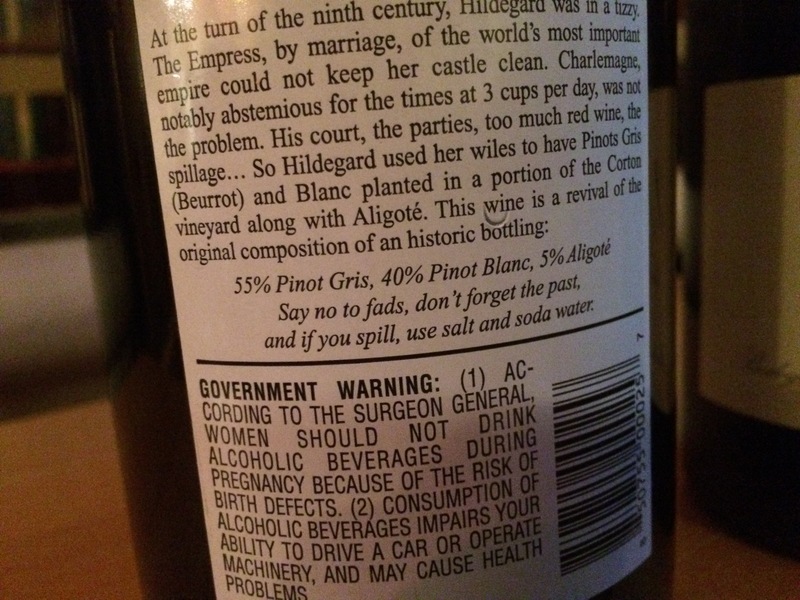 Au Bon Climat – Back Label. The Au Bon Climat is soon almost gone, and we are called upstairs to pour wine for the dinner. After completing that duty, we again retire to the den with plates heaping with amazing Tuscan delicacies. We finish the white wine and the evening is declared a success. Oh, I’m fine with no one at the cooking class knowing that we did not drink the co-op wines. AND I want to stress, that my commentary in no way indicates anything negative about Mary’s Cooking Classes – they are amazing.